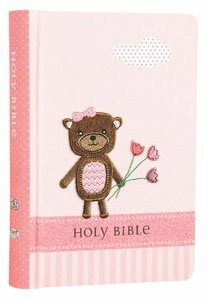 About "ICB Baby Bear Bible Pink Stripe With Bear (Black Letter Edition)"
Welcome your new baby with the sweetness of God's Word, all wrapped up in blue or pink. This full text International Children's Bible has a clothbound cover printed and appliqued with a delightful bear. The Bible includes a presentation page, maps, front inserts, and a ribbon marker, all in a clamshell box?the perfect present to tuck into a gift basket for the newborn.